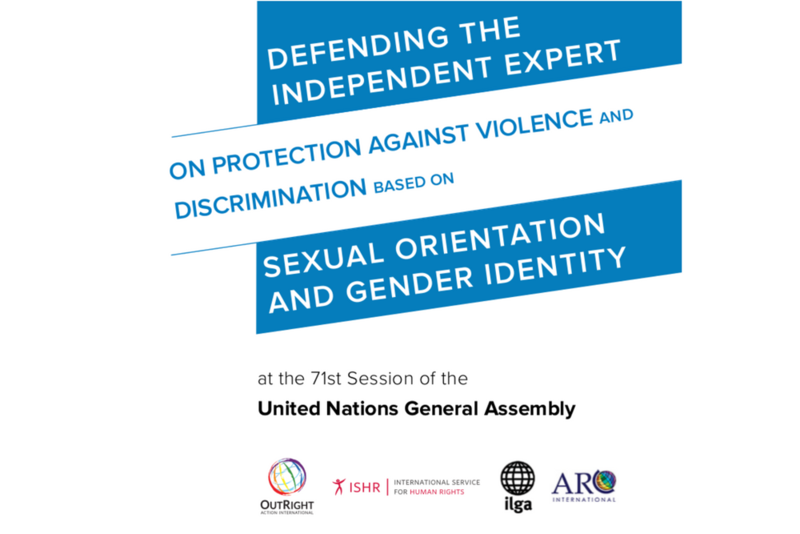 (New York, 27 October 2017) - Today the United Nations General Assembly (UNGA) will hear a report from Thai Human Rights Law Professor Vitit Muntarbhorn, the United Nations Independent Expert on the protection against violence and discrimination based on sexual orientation and gender identity (IE SOGI) for the first time. To mark this historic event, four human rights organizations released a joint report today detailing the establishment and confirmation of the mandate at the United Nations (UN) over the 2016 UNGA. Civil society played a strong and crucial role in defending the mandate with representation from every region of the world. Notably, civil society mobilized vigorously across all aspects of the hostile attacks, including in the development and distribution of two open coordinated letters addressed to Member States of the United Nations urging their support for the IE SOGI. The first letter – initiated during the debates in the Third Committee – was signed by over 850 organizations representing over 157 countries. The contents of the civil society report offer an evidence base for countering arguments based on misinformation, fear and generalization. The voting records, analysis and transcripts can offer guidance for planning future international, regional, and national advocacy on the human rights of LGBTI people.